Interested in a diamond engagement ring? Raymond Lee Jewelers has been in business for over 30 years and one of our main specialties? Selling diamonds. 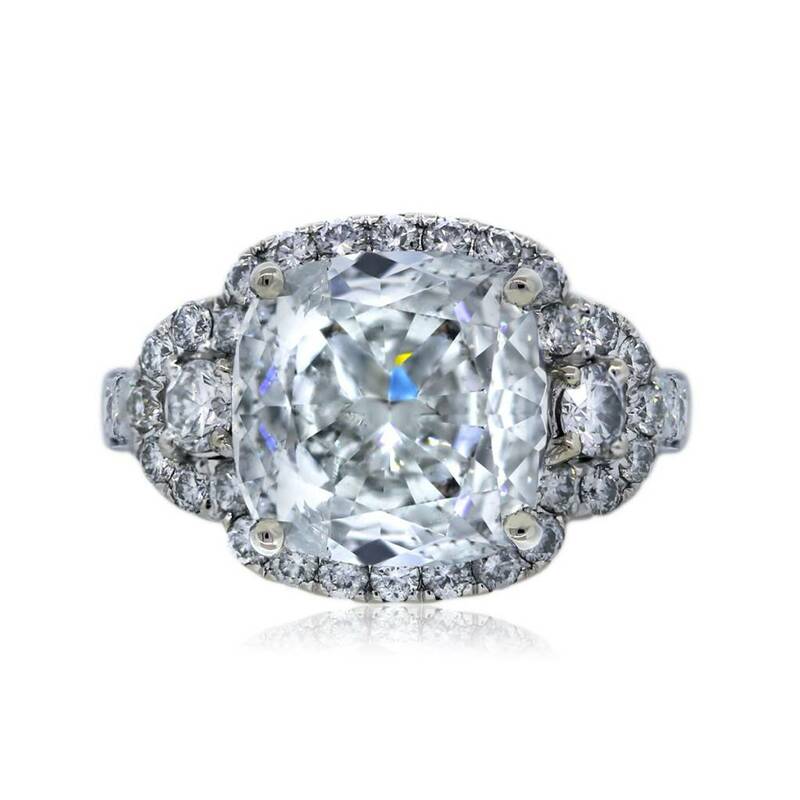 This cushion cut ring is in fabulous condition! The center stone weighs an approximate 3.57 carats and the color is H-I and clarity is SI3. This is a great diamond for a center stone, the color is nearly colorless. According to GIA stones that are D-H are considered nearly colorless, which in retrospect is considerably a good tone for a diamond. SI3 means slightly included, you would be able to pick up on very small inclusions, but nothing that will stop people and see any disruptions in your diamond. The ring fits a 6.75 ring finger and can be sized. The Diamond is set in a 1.16 carat total weight diamond mounting! The sparkler is a 4 prong halo setting and is trending hard! Categories: Cushion Cut Engagement Rings, Diamond Engagement Rings, Engagement & Wedding | Raymond Lee Jewelers, Halo Style Engagement Rings. Tags: cushion cut, Diamond Ring, Engaged, Engagement Ring, Gold and Diamonds, Halo Setting, Wedding Ring.